This notable metal sculpture is here attributed, with some temerity, to the Punjab, meaning the plains north-west of Delhi watered by the five great rivers (Panj-āb: five waters or rivers) tributary to the Indus. No metal images of the period have yet been found there, but the attribution seems reasonable in view of the figure’s many iconographic and stylistic affinities to numerous images from Kasmir and the Swat valley, including graffiti on boulders in the latter region, combined with a suavity of modelling which seem to relate it more closely to Gupta and early post-Gupta sculpture in metropolitan India. The iconographic formula, with the Bodhisattva seated on a wicker stool or toilet, upon which one leg is drawn up and laid flat (lalitāsana), his right elbow leaning on the upper part of the leg while the hand points to the slightly inclined head, harks back to the art of Gandhara. There, relief figures on Bodhisattvas, always subsidiary figures, frequently appear in this pose, usually with the index figure of the right hand actually touching the head. So far this pose has not found a corresponding description in the texts, but its undoubtedly pensive, and perhaps sorrowing mood may indeed indicate the Bodhisattva as mahākāruṇika (“Lord of great compassion”). More generally, the two-armed figure, with the left hand holding a long stemmed lotus, can be indentified as Lokesvara, another name for Avalokiteśvara, or Padmapāṇi, “he who holds a lotus”. Several images, notably the splendid one in Asia House, New York (Mr. and Mrs. John D. Rockefeller 3rd collection), include all these essential features, as well as the sacred thread and the animal skin over the left shoulder, are indisputably from Kashmir or Swat. They usually display, however a small figure of a meditation Buddha in the head-dress [see EAOS.61], missing here. The shape of the petals of the beautiful double lotus band atop the stool in the Ashmolean figures is pure Kashmiri and so is the rather dropsical outline of the left leg. 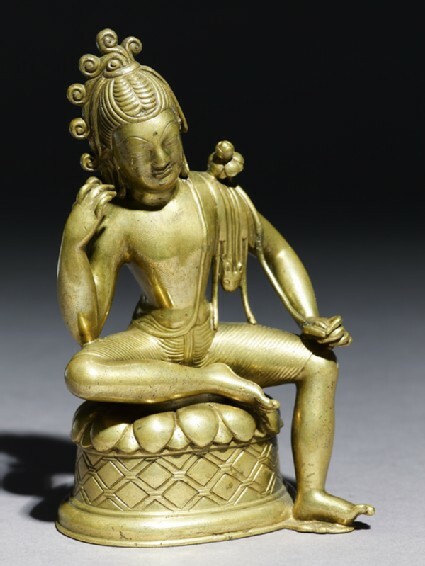 But the plastic quality is quite different, closer to early post-Gupta norms in its suavity, compared to the often slap-dash modelling of Kashmiri bronzes and their almost buttery quality, due in part to the high proportion of lead in their composition. The smooth torso of the Ashmolean’s figure totally lacks the rather ostentatious chest muscles of most Kashmiri sculptures. Lead is notably absent, replaced by a large admixture of zinc, turning the alloy into brass, which results in a feeling of hard precision. 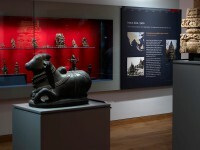 Two other features distinguish this Padmapāni Lokeśvara from Kashmiri figures. One is the way in which their hair, apparently gathered into a ring at the top, cascades down in a series of wire-like volutes on one side of the head, and drops down in two large loops on the left, a combination not seen elsewhere. The other is that the pelt on the shoulder has a lion rather than a deer head. This again suggests post-Gupta India, where Śiva, associated with the lion-skin, tends to share icnonographical details with Avalokiteśvara. This image, like many other metal sculptures from the north-west of the India sub-continent, came out of Tibet in recent years, where it had most likely been for centuries.